MC Next is the leading construction layout software for contractors and subcontractors. 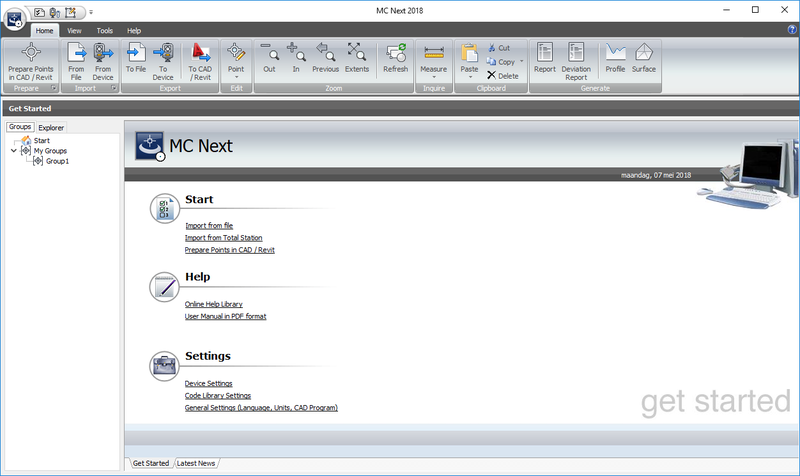 The MC Next software supports all the functionality of the MC Start software. MC Next is ideal for anyone who needs to conduct layout on the job site. 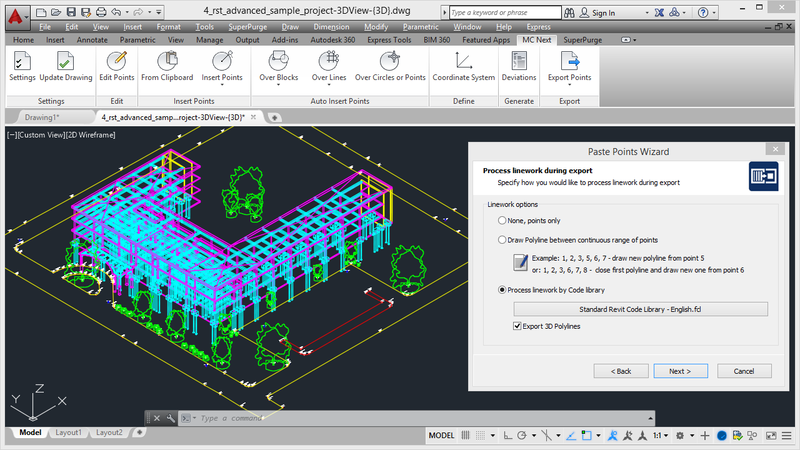 Automatically create points on objects and export point locations to a range of robotic total stations. Use model coordinate information at the job site to improve office-to-field efficiency and QA/QC, reduce rework, and increase construction site layout productivity. 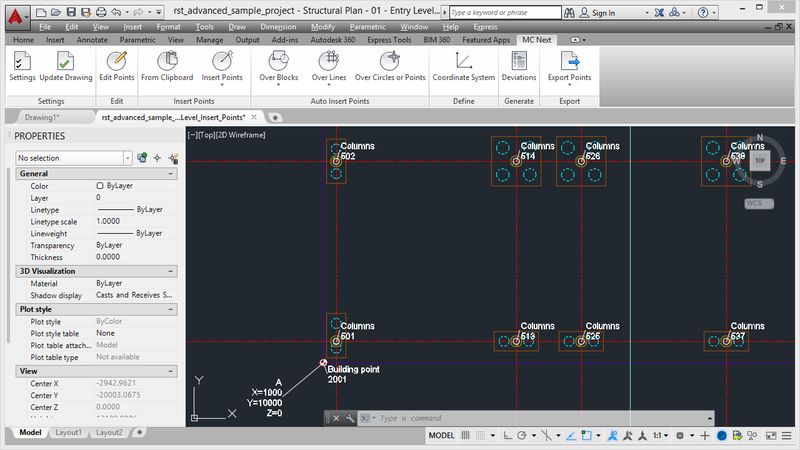 With MC Next you can swift and reliable place measuring points in CAD / Revit. Common used measuring points are foundation piles, angular points of pads, bending points of foundation beams, intersections of grid lines and so on. With one single mouse click you insert a measuring point symbol within models and with another one or two mouse clicks the point number is inserted at the desired position. Automatically create points on objects and export point locations to a range of robotic total stations. 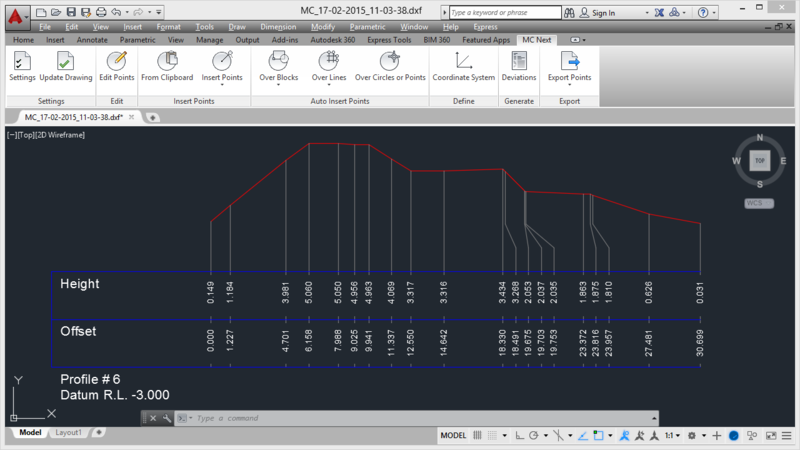 MC Next has advanced automated tools that allows you to superimpose measuring points on top of already existing ‘Points’ within models. 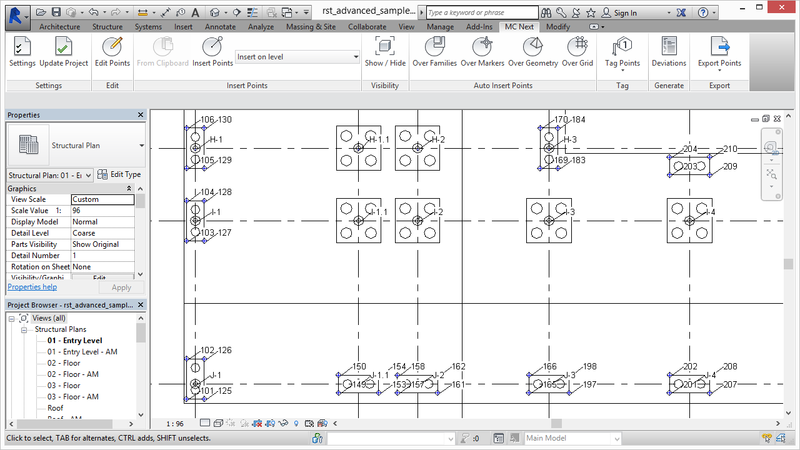 These points have several forms, like blocks, lines and circles in CAD and families, grids and geometry in Revit. This way you generate hundreds of points with only a few mouse clicks. Add coordinate systems that match the job site. The Coordinate System wizard will help you to define a new coordinate system by specifying two base points (A & B) in the model. These two points will represent your new coordinate system (MCS) without modifying the model. For example: Point A is new origin (0,0,0) and Point B is the new +X-Axis direction. 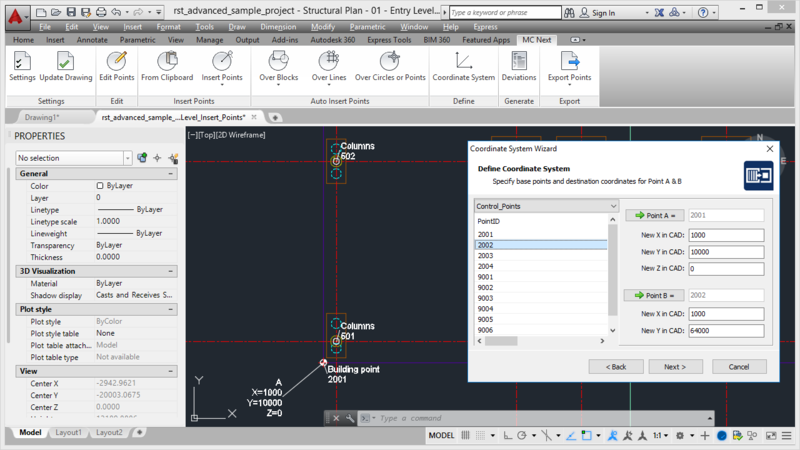 MC Next offers you a simple and unambiguous way of defining the Coordinate System for all the models within a particular project. Perform QA/QC and generate advanced point comparison reports. 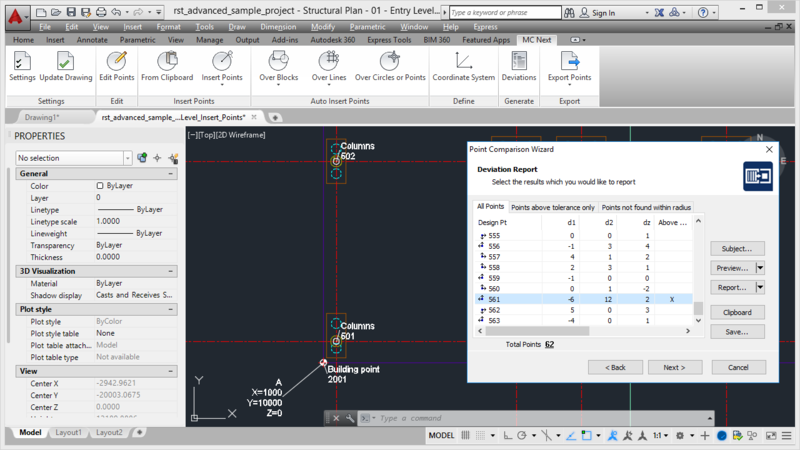 The Deviations Wizard will help you to compare measured points with the original design points in the model. You can report and display the deviations in the model. The Point Comparison is designed for use as an assistance in Quality Control (As-built) surveys. The feature coding system of the MC Next software is designed to allow the computer to relate codes to the automatic creation of a CAD drawing. Each code is given a description, such as Fence, Tree, Manhole, Kerb. These same descriptive notes can be used as feature codes in the field. The feature coding system is ideal for renovation projects and any other activity, where accurate CAD drawings of the current situation are required. The Generate Profile Wizard will help you to generate long and cross-sections and export to a CAD drawing. The wizard is designed for use as an assistance in roading development, river control, and any other activity where accurate sections are required. You can define and export the profiles to a drawing by following a few simple steps. 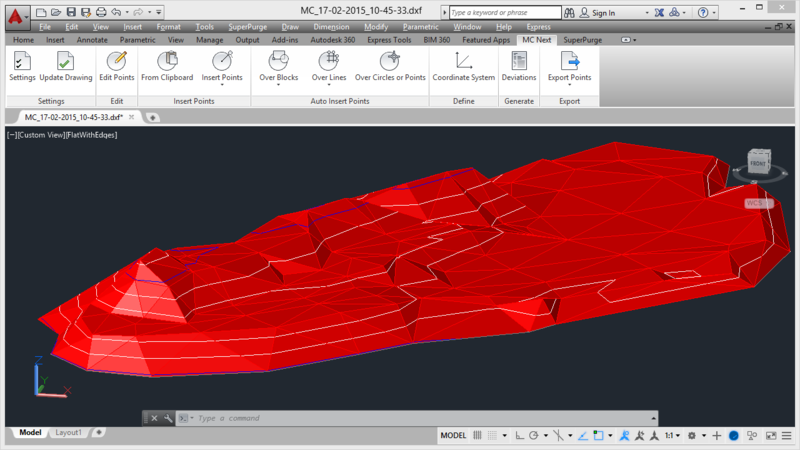 To calculate enclosed volumes of digital terrain models (DTM), use the Calculate Volume Wizard in the MC Next software. The wizard is designed for use as an assistance in stockpile calculations and monitoring the filling of refuse pits and other such areas. 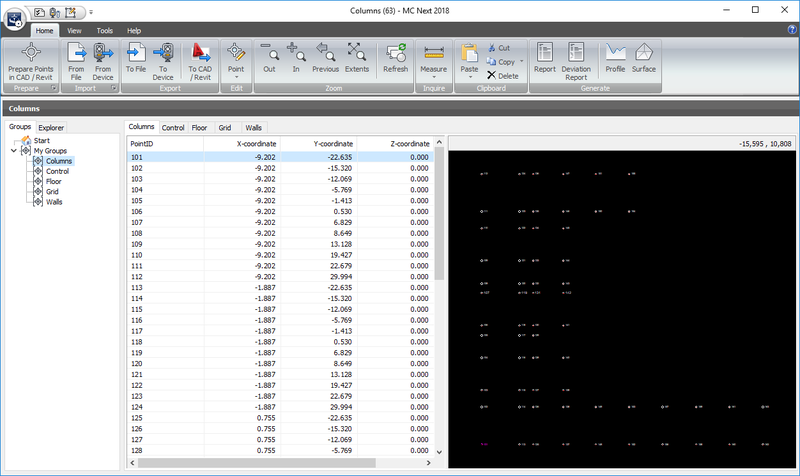 You can report the calculation results and export the DTM to a drawing. View MC Next software videos and see demonstrations of the capabilities MC Next offers to enhance your Field Layout workflows using CAD / BIM.